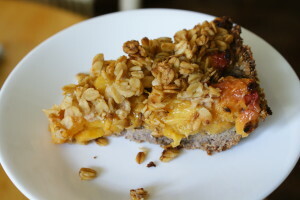 A friend and I were watching Martha Stewart whip out a couple of delectable looking peach pies recently and I vowed to create a version that my low sugar, gluten-free family could enjoy. This one has a pat-in-pan crust and an oat crumble topping. It was very easy to make and has a fresh taste and moist texture. Mine held together well enough to lift slices cleanly from the pie plate. Peel, pit and slice peaches and toss them with the other ingredients in large mixing bowl. Grind nuts in a dry blender until well ground. Use a stop/start action, stirring with a chopstick or butter knife to redistribute after each stop. Stir in salt. Add water and stir. When you can squeeze a small handful so it holds together, there’s enough water. Grease a 24 cm (about 9 in.) pie plate with coconut oil, or spray. Pat the quinoa/pecan mixture into the pie plate, bringing some up along the sides. Set oven for 400 degrees F.
Stir butter into oats and add remaining ingredients, stirring again. 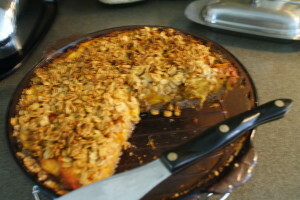 Pour peaches into pie shell and top with crumbly oats. Bake at 400 F. for 15 min. then reduce heat to 350 and bake for 45 min. more. Oats should be golden brown. Let cool on a rack for at least an hour before cutting. 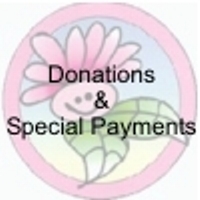 Click image to donate. Thank You! Copyright © 2019 ORGANIC ANNIE'S Green Gourmet. Powered by WordPress and Stargazer.